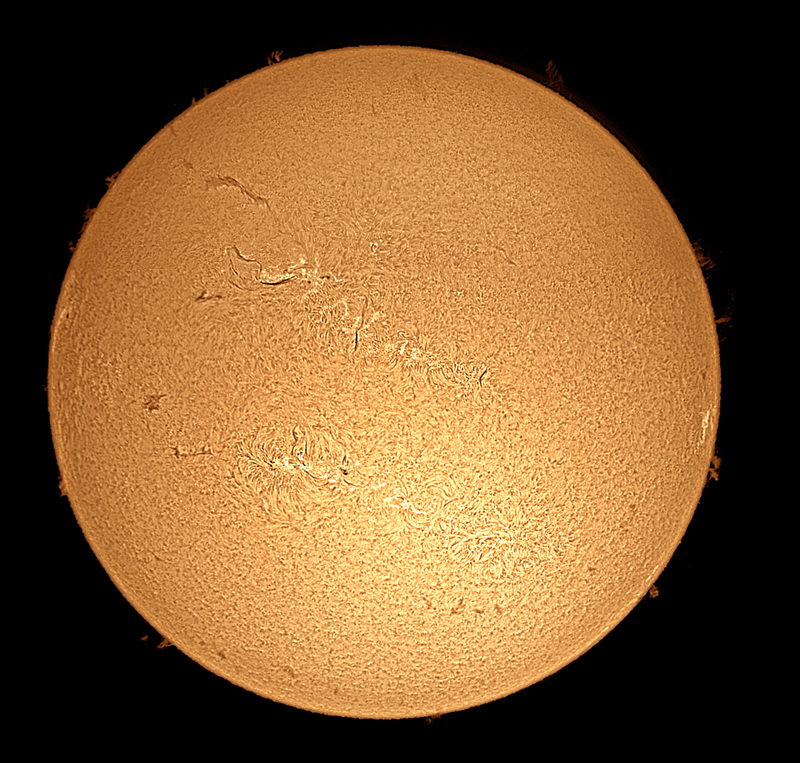 Taken with the DMK31 and the new SS solar filter on the Skywatcher 80ED, a stitching of 3 frames. Still playing and getting to know the kit by taking pretty pictures. It's a very busy subject. Marvellous filter, made by Mark Wagner. Thanks Mark! I must try with a DSLR for the larger chip and small pixels. The .avi files were processed in Registax, and finally stitched and fiddled with and coloured in Photoshop. 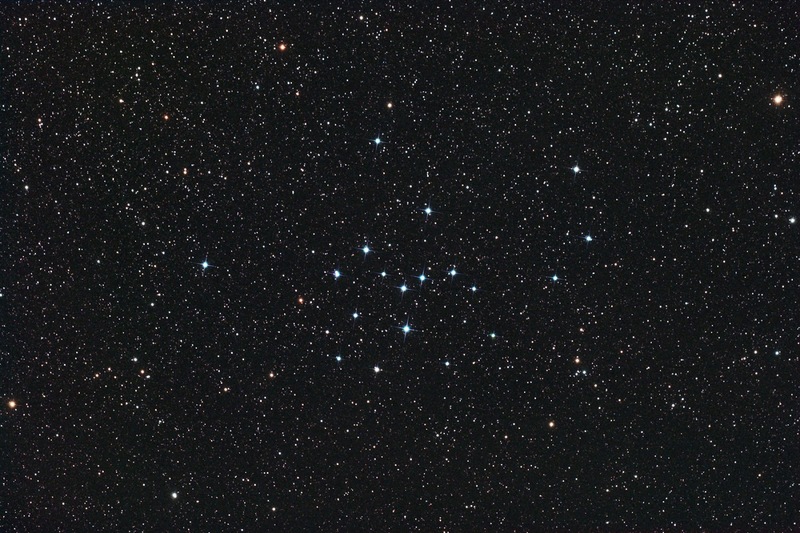 This was taken from the Austerfield Observatory as a test for the new Focal Reducer to the 106FSQ, on a clear night with the malevolent moon looking on through some haze and heavy dew, not the best of conditions, but it was a test for acreage and composition, and in that latter the cluster looks a bit lost, but perhaps because I'm used to seeing it fill the frame more. 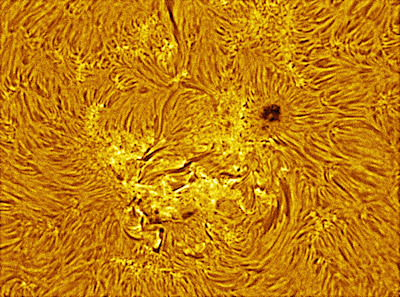 I used the 106 with a .73 focal reducer and an M25C. 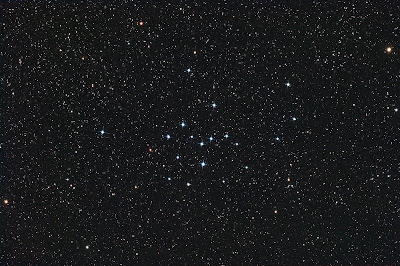 The guiding was with the H9C in the Vixen260L and an AP .62 focal reducer, to gain a wider field for easier choice of fatter stars. All this sat on the AP900GTO mount. The exposure was 15x300sec. 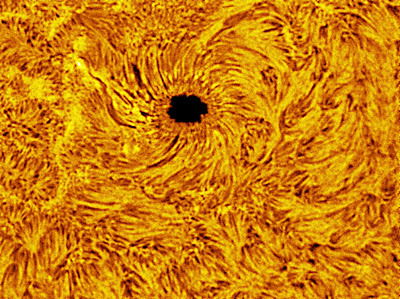 Calibration in Astroart with masterflat and master bias and stacked by sigma average. Finally processed in Photoshop. 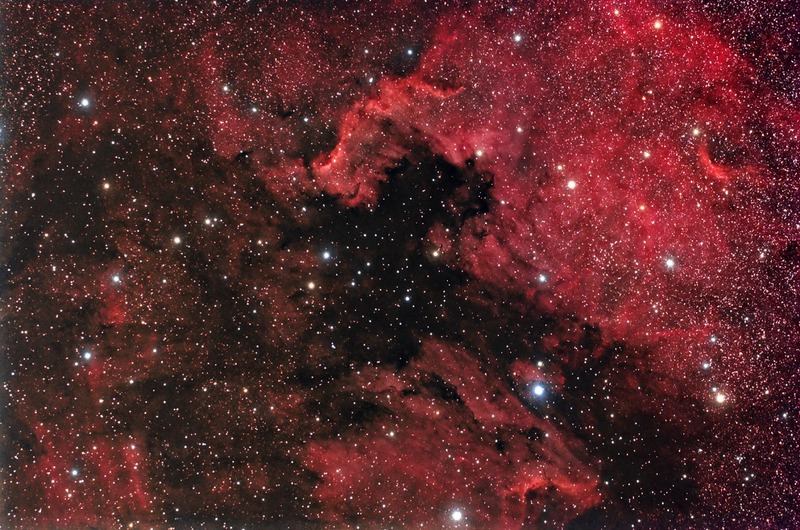 An exciting emission and reflection nebula in Cepheus, namely NGC 7538. 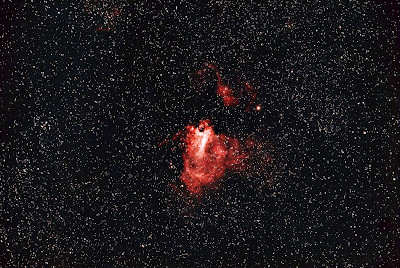 It is the host to ongoing star formation and includes the largest known protostar. 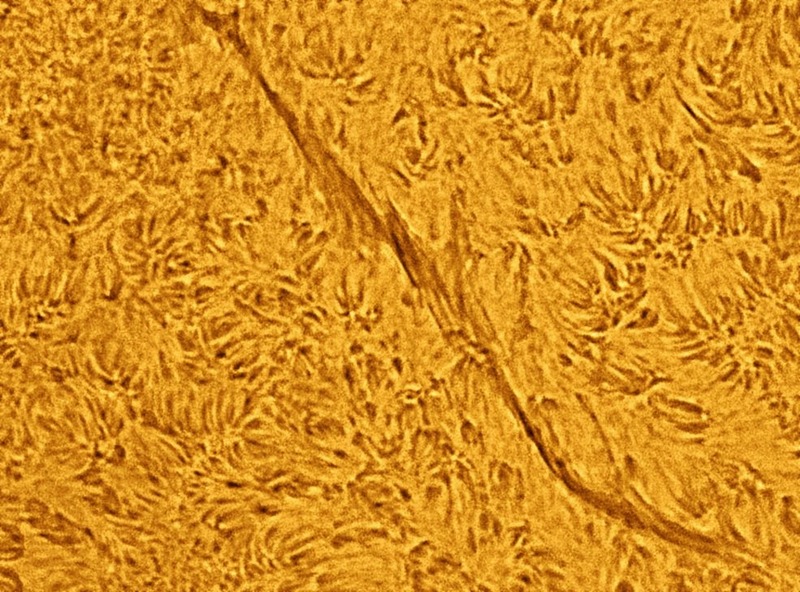 This is, apparently, embedded in a collapsing core of 85-115 solar masses on the way to becoming a high mass B star. 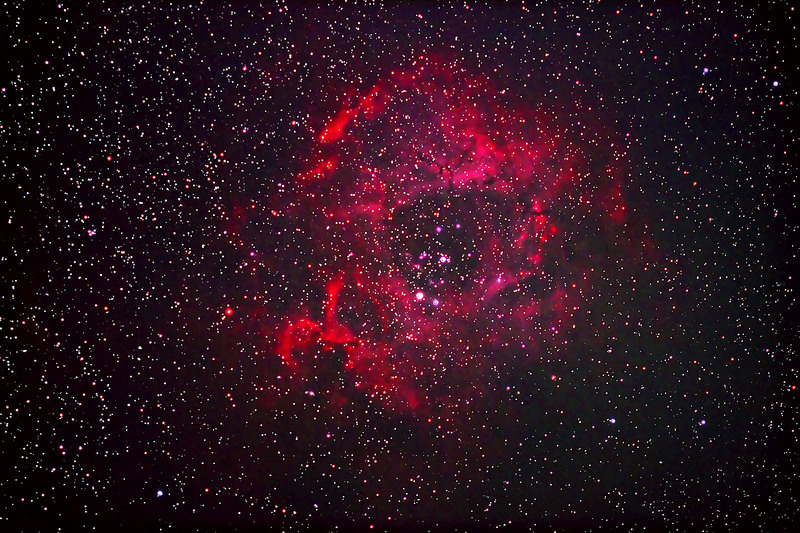 Taken by Rhys Owen from Hatfield on the 8th of September, using a modified Canon 600D on a Takahashi 106FSQ. Guiding was done with a Celestron Nexstar8 controlled by PHD. The exposure was 3x500sec., captured in Nebulosity, calibrated in Astroart with darks, no flats, and finally processed in Photoshop. I hoped to take some dark sky pictures whilst I was away, however there was a lot of light pollution from the hotels and local towns. 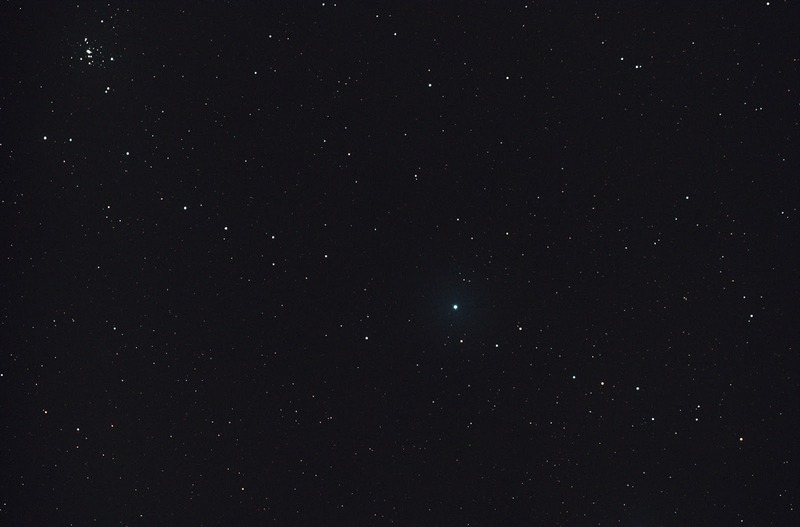 So I took a chance one night and pointed my Cannon 1100D at the sky. 18(28.8)mm f3.5, 15secs ISO 1600 and hoped for the best. Just used 6.3M JPEG, well I wasn't sure it would work. This was 6/9/2013 @20.45 from St Lucia -28.37 South, 32.41 East. The first one has been a little processed. 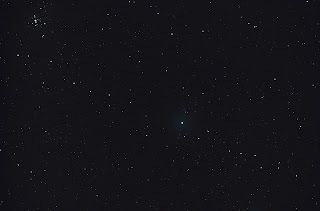 the cluster is M7, Antares at the bottom of the view. Sag A* is in the top layer of dust, to the right of M7. 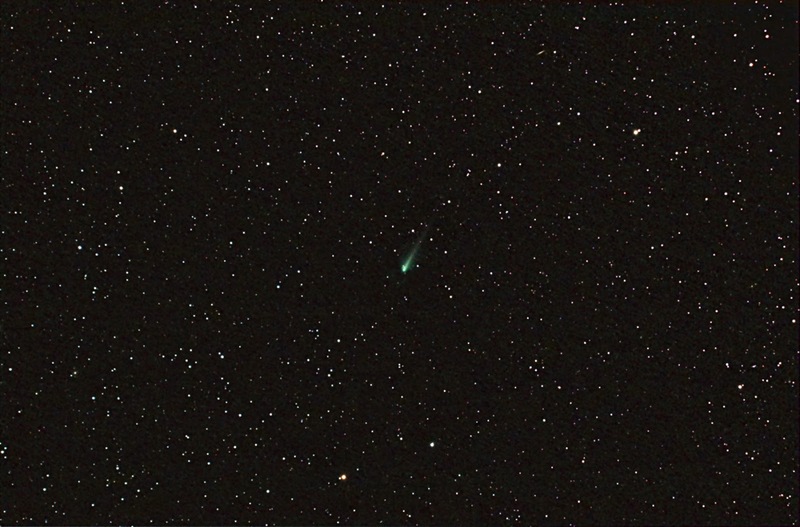 Further testing with the Takahashi focal reducer, taken on 7.9.13 from the Austerfield Observatory. With my M25C I usually get only the upper large part of the nebulosity, the North American (Buffalo) and a touch of the Ferret, but the FR embraces a field a good bit wider without costing much in resolution. I'd hoped to include some nebulosity further to the left, south, of the snout of the Buffalo, but failed. 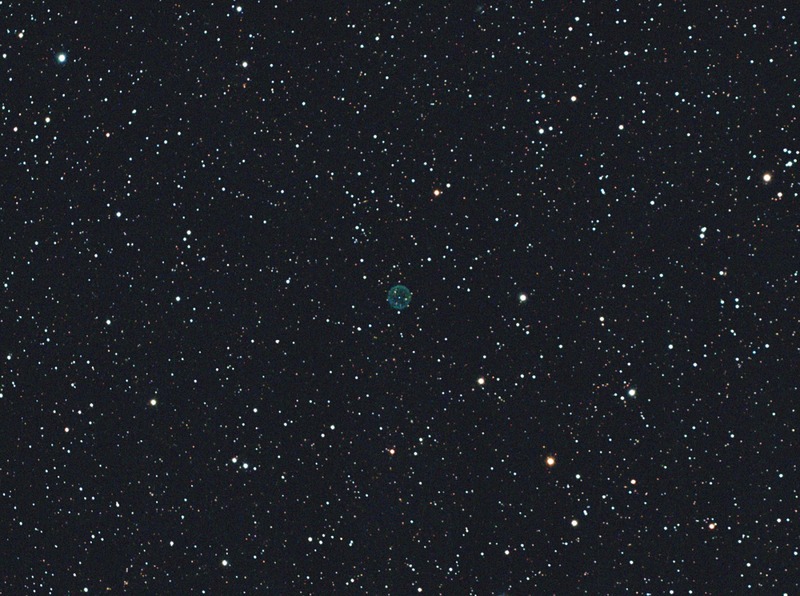 The guiding was done with the H9C on the Vixen with an AP .62 Focal reducer controlled by Astroart5. 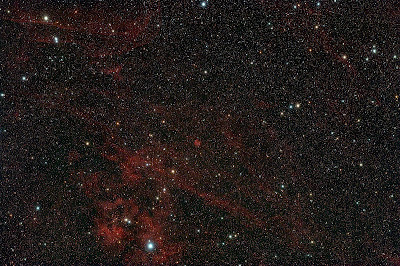 Flats and Bias frames were used in the calibration in Astroart, with final processing done in Photoshop. Not the greatest, but certainly a success for me in terms of a useful piece of kit proved out. I recently bought Dave Adshead's focal reducer for my 106 but it wouldn't focus when used with my M25C camera. And after a prolonged series of trials with different spacers etc., with a dealer of﻿ Takahashi telescopes, this is the final test on a faint area of nebulosity in Cepheus recorded in the second catalogue of Stewart Sharpless of "bright" nebulosity. It's also known as the Flying Bat, and is far more extensive than this frame of the brightest part. 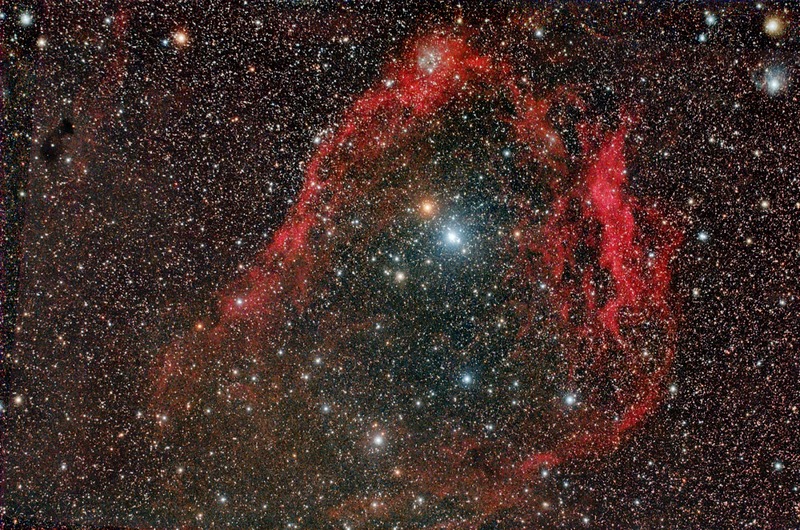 The FR gives the telescope a focal length of 387mm, but this bit of nebulosity would need a focal length of 150 to 250mm, so mosaicking or a camera lens would be the solution. But I've not enough patience for doing mosaics so I may try my old 135mm Pentax lens, some time in the future. 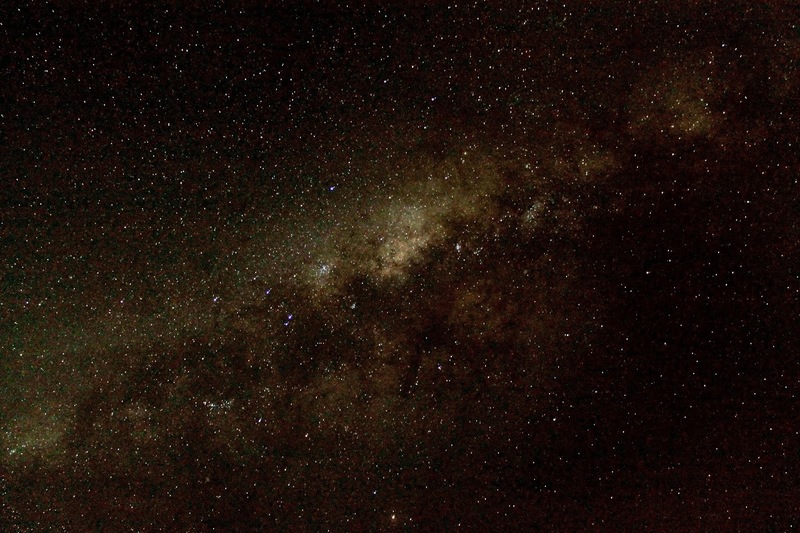 The night was cloudless but with haze, though the Milky Way could be seen all night. The dew was heavy too, and the car was wringing wet. 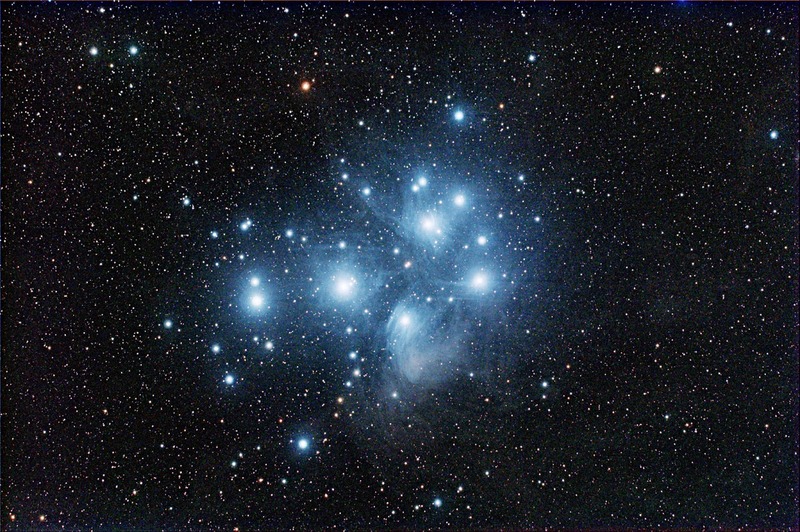 The exposure was 220 mins in total, and the guiding was done by my trusty H9C and Astroart. Stacked in Astroart and finally processed in Photoshop. 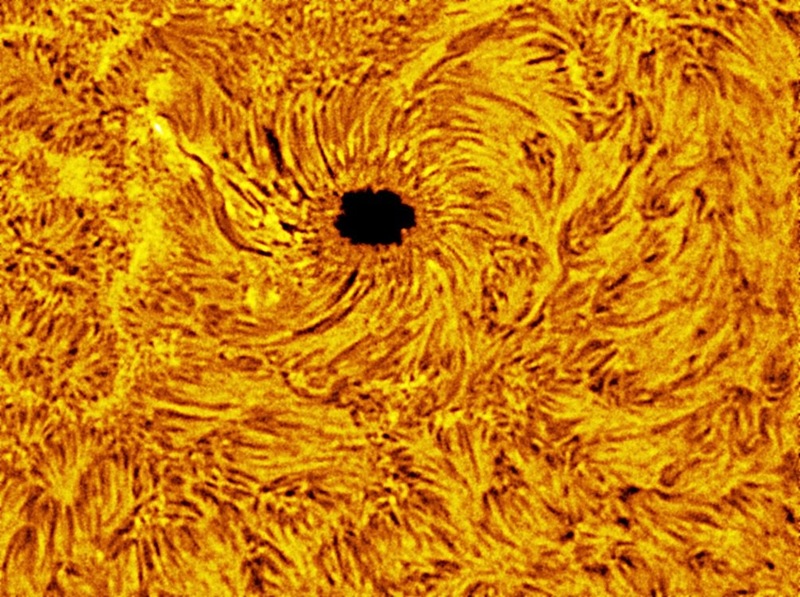 Taken by Rhys Owen on the 13th of August, from home using a modified Canon 600D DSLR with an Astronomic CLS filter on a Takahashi FSQ106ED. The exposure was 30x60sec at ISO1600 and recorded in Nebulosity. Then calibrated with 5x60s darks and stacked in Astroart, and finally processed in Photoshop. This is a stack of 9 x 1 min. taken on 8.8.13, from Bessacarr by Bill Hughes, under Sodium Vapour street lights. The camera was set at ISO 1600, with a 50mm. 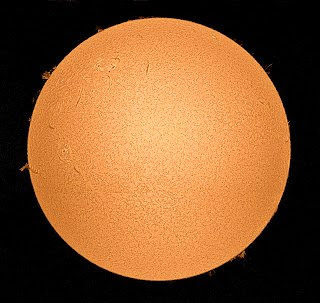 F2.8 and an LPR filter. 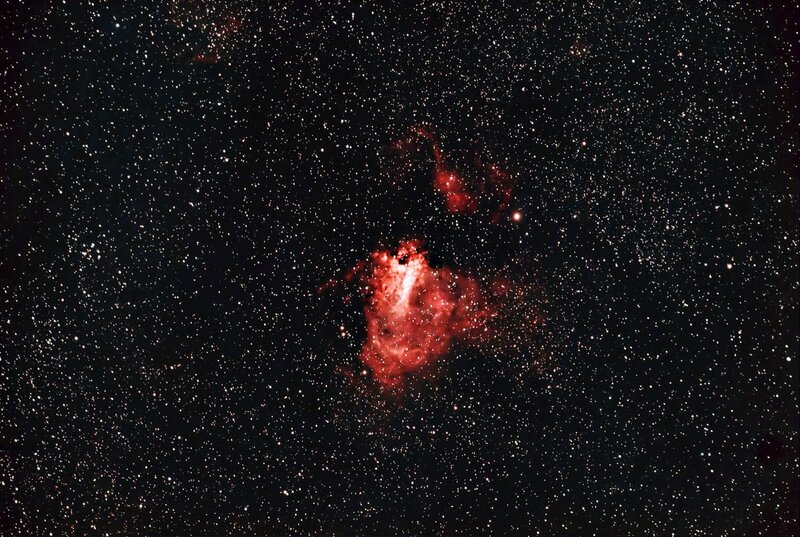 See if you can pick out the nebulous areas, the largest and brightest is the North American Nebula, NGC7000, near the middle left with the Butterfly, NGC1813d, lower to the right. Another by Bill Hughes from the same location and using the same camera with the gain set at ISO1600. The same street lights were doing their best to spoil things too. The lens fitted for this was a 14mm f2.8, so drawing in a much larger area of sky. The exposure was 10x1min. Again see what features you can recognise. In both cases the processing was done in Deep Sky Stacker followed by Photoshop. Taken on the 5th of August 13, as a finish off to a 4 hour job, when the sky was dying out. 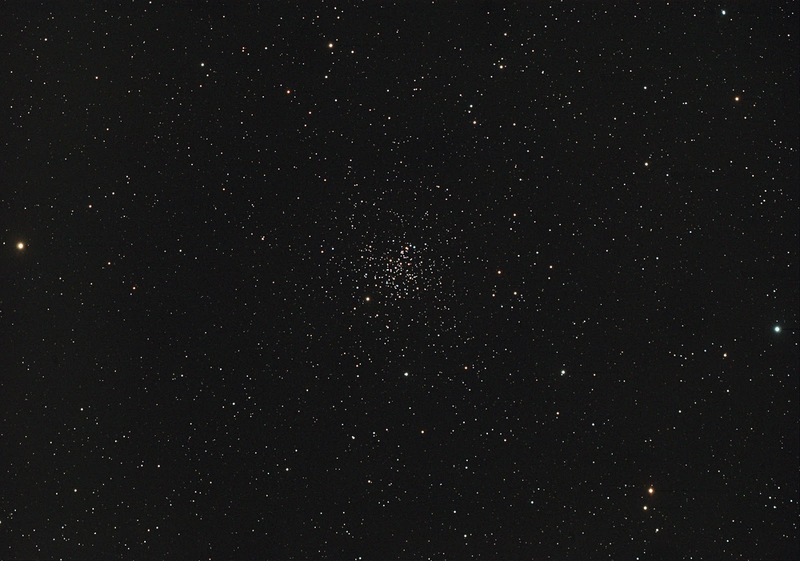 The usual kit was used, M25C in the 106 and the H9C guiding with a .67 focal reducer in the Vixen 260. Stacked in Astroart with bias and masterflat and processed in Photoshop. The exposure was 11x120sec. 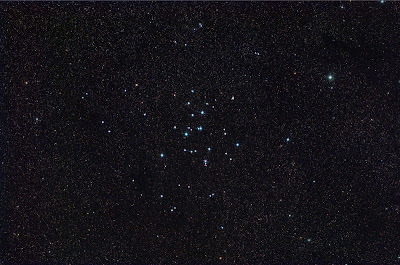 A wide cluster of blue stars, not many but clearly blue. 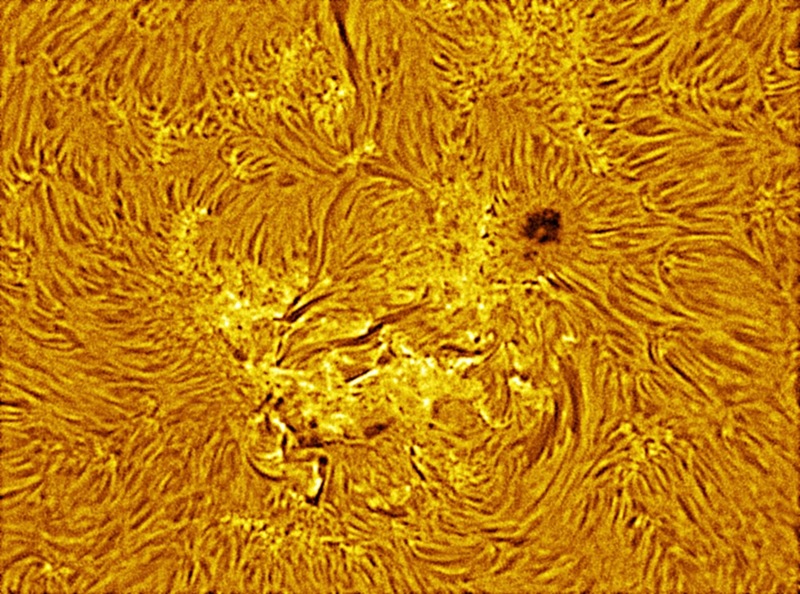 Taken from the Austerfield Observatory on 5.8.13, with an M25C in a Tak106 at native FL. Guided by an H9C in a Vixen VMC260L with a .67 focal reducer. 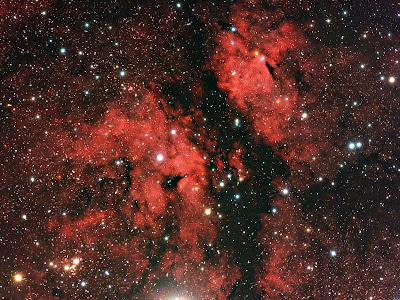 Nebulosity controlled the taking camera and Astroart the guiding one. Stacked in Astroart and processed in Photoshop. The spikes are of course artificial. Perhaps worth more time on it to highlight the dust lanes more. 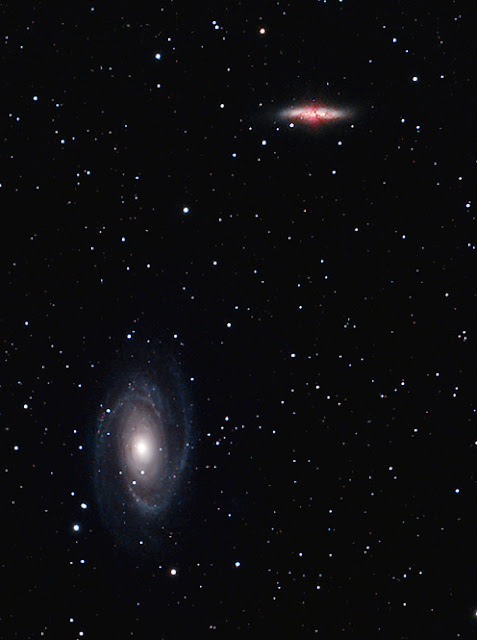 Taken on 3.8.13 from the Austerfield Observatory with the Tak106 and M25C. Not a great night, hazy and with intermittent cloud. 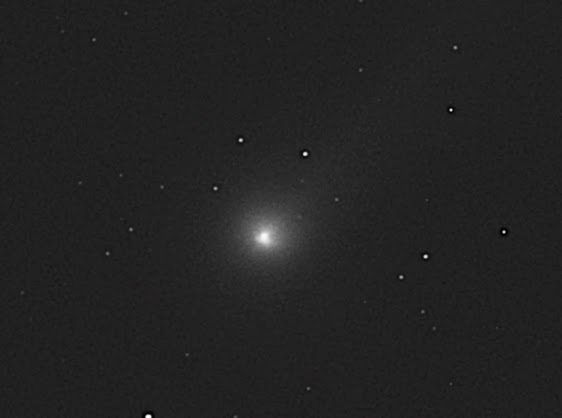 Guided by an H9C in the VMC260 with a .67 focal reducer. 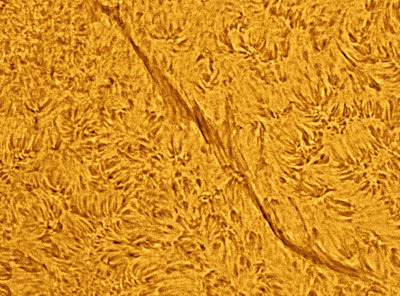 The focal reducer helped find and hold stars by brightening them through the haze, but couldn't help it see through clouds. 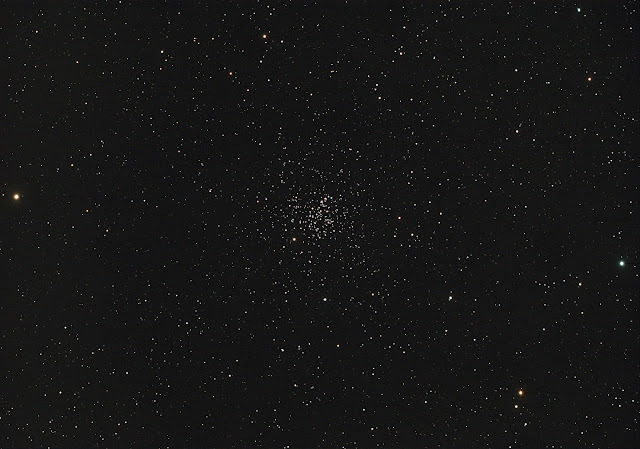 The small cluster to the lower left is NGC6910. 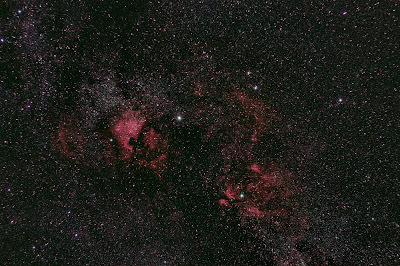 North is to the right with extremely bright Sadr cropped to just a glow at the bottom edge of the frame. 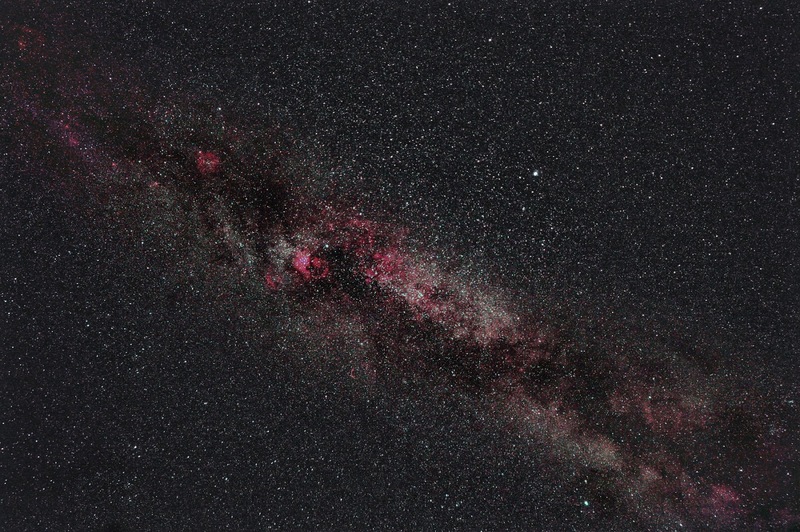 The exposure was 21x300sec, stacked in Astroart and processed in Photoshop. Another one of the Sun taken from Austerfield with the DMK camera and PST telescope﻿, 60sec of video on two parts that had to be stitched together. I'm beginning to understand the settings to get the best of it. Processed in Registax6 with final adjustments in Photoshop. The camera is monochome so the colour was added separately in Photoshop. I took this today, 25.5.13, at Austerfield, with the DMK and PST, using my Dell laptop. The other one will be left out on a hillside some quiet night. 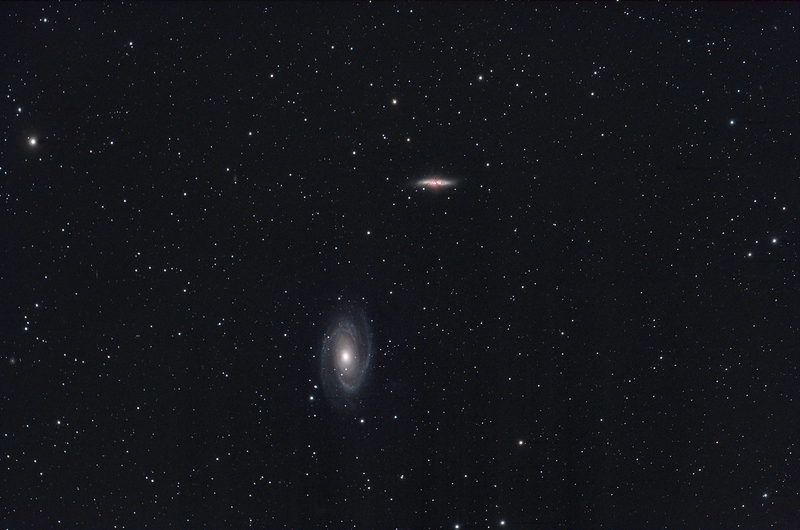 1200 frames processed in Registax6 and fiddled with in Photoshop. The DMK hasn't a large enough chip to cover it all so it has to be done in two halves and stitched together, not too easy with the PST's "sweet spot", or rather hot spot. 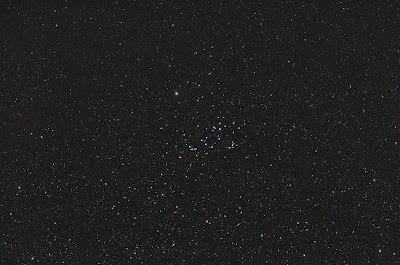 Taken on 15.5.13 on a night without clouds, some haze of course, but a goodish night. The DSLR is giving me alignment problems, in focus one side and not the other, so I reverted to my old M25C, which never seems to drop a beat or get upset with my rough treatment, nice job Terry. 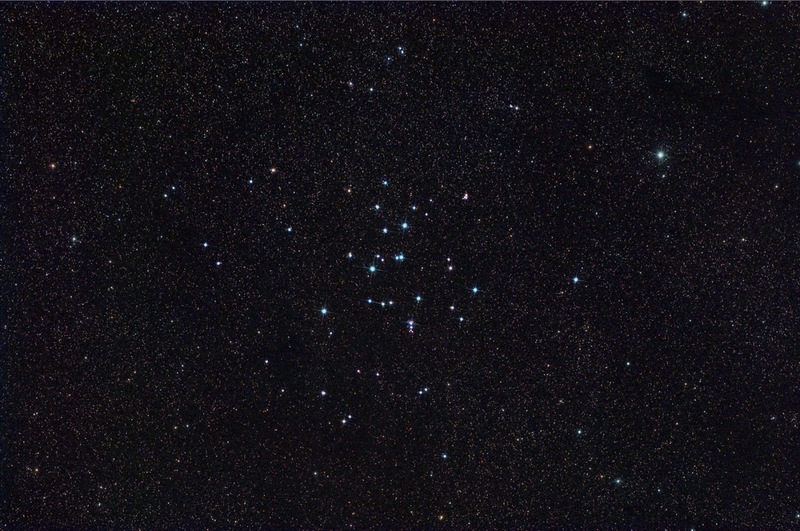 I took 27x300sec frames and the usual flats, then sigma averaged them in Astroart, and finally processed the result in Photoshop. M81 has a large dynamic range though it may not appear so at the start, and adding the 27 in Astroart produced a burned out core which processing cannot correct. So I'll try again later by adding subsets of 3 or 4, then averaging the subsets. The lower one is a crop from the upper one, but though that composition isn't the best for this pair, I was trying to get other fuzzies in too, and there are some near the edges. The equipment uses was the 106 and M25C, guided by the H9C in the Vixen, all sat on the 900GTO mount. 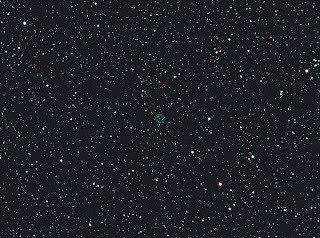 This is tiny, well, not so tiny as planetary nebulae go (2.8 arcmins), and faint. 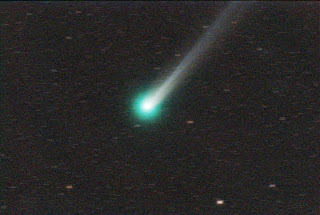 Almost invisible in single frames of 5 mins, so I had to add 33 frames of that length, during a surprising night without cloud. In fact almost the whole of the week was without cloud. The Cloud God must be on holiday. There was some haze though and I had 8 frames that I should have dumped because of that, but included, and have had to make processing adjustments. 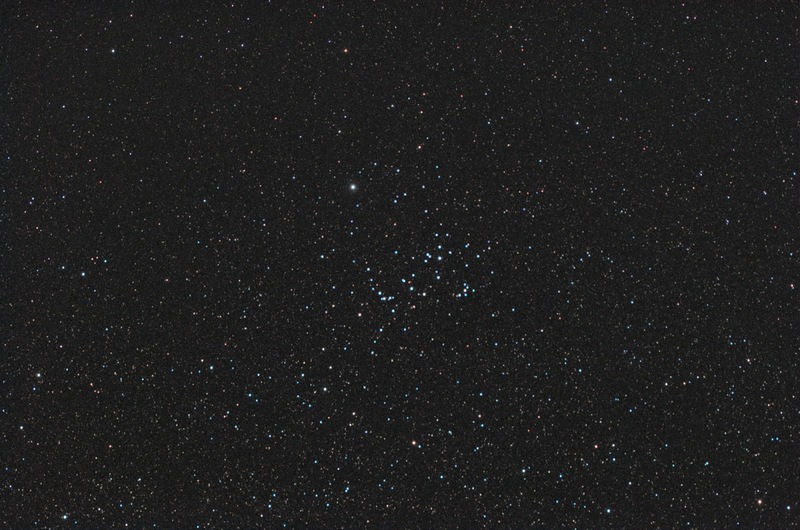 Taken on 1.5.13 with the M25C in the Tak106, guided by the H9C in the Vixen260. 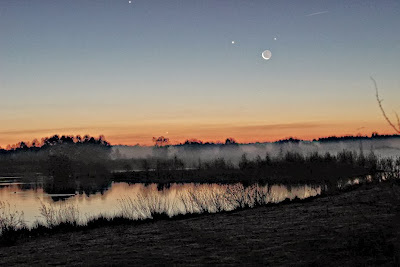 The fat Moon rising in the dawn put a stop to it all, in fact some of the 8 hazy frames were due to that. It needs more data so I may do it all again. It hangs there in space like a green bubble. Love it. The data was acquired in Nebulosity, then pre-processed in Astroart and finally processed in Photoshop. I have spent all morning trying to make a panorama of two of my aurora photos. It had to be done manually as the difference in time between the two photos meant that I could only merge the stars OR the landscape accurately. In the end the landscape had to win and the resultant picture covers a horizontal field of view of about 180 degrees. It gives a very good impression of how the auroral oval actually appeared (if you turned your head as far right and then left as far as it would go). 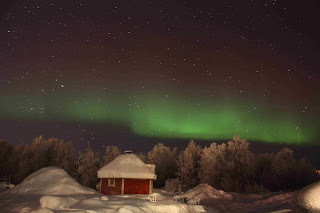 To the naked eye, the green of the aurora was obvious but all the other colours seemed to be silver and the “light pollution”was not obvious at all. 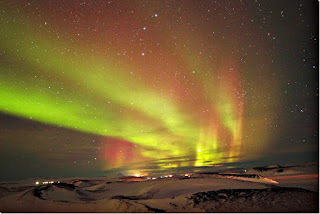 It seems we must get away from Britain to see clear skies, and another recent trip to Iceland by Bill Hughes this time, enabled him to take these. 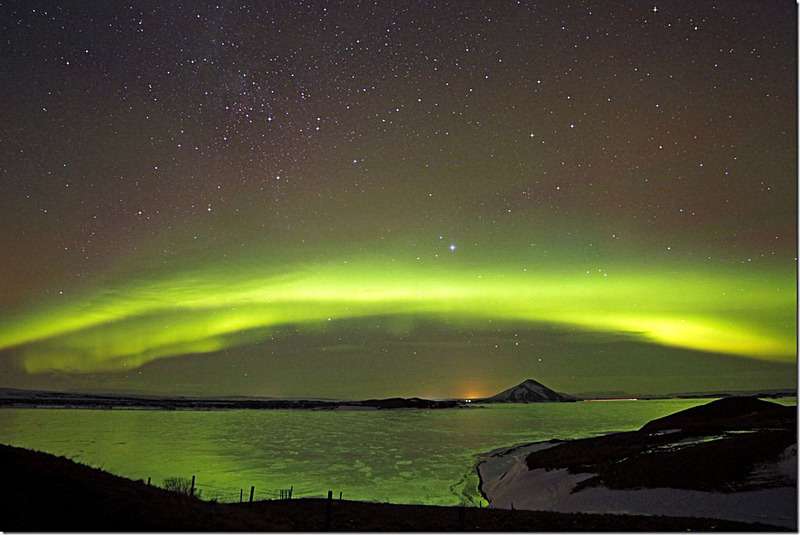 He was luckier than others in having 4 clear nights with aurorae each night. 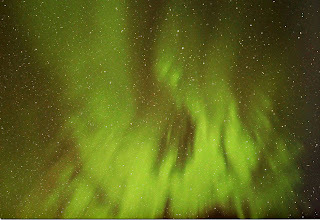 His Canon 600D had a 14mm F2.8 lens set at ISO 1600 exposing for 25sec for each. 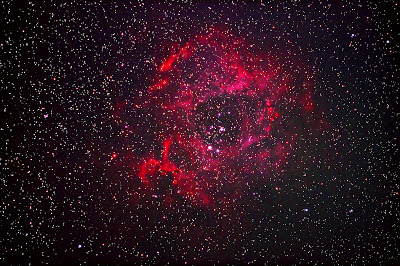 Processed using Auto Smart Fix, Noise Ninja and Star Spikes, with a little help from Photoshop. Taken by Rhys Owen, with a DSLR Canon 600, newly acquired and newly modified too, he obviously means business. The forecast was good, clear all night, but he must have had an inside source that told him it wasn't going to hold. He rushed in, set it all up and spent long enough focusing, and it takes some time to do it if you're using trial and error rather than software to do it. 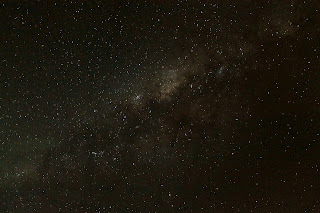 A short couple of 30 sec shots to test and then on with a series of 20x60 sec frames at ISO800, followed by 4x60sec darks. He sat and ran them without any software control, counting them as they went. 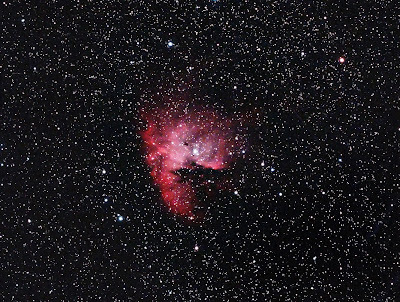 All I had to do was find the nebula and set the telescope to point at it and balance the mount suitably. Almost as soon as he's done, the clouds started to roll in. He must have known. The frames were stacked in Deep Sky Stacker and post processed in Photoshop to produce the final result. 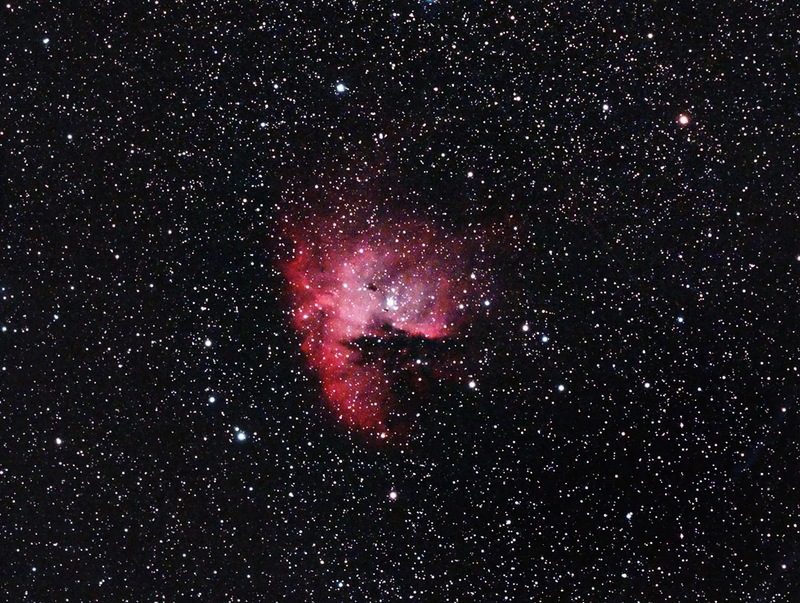 Taken by Rhys Owen using his Canon 400 with a 50mm lens at ISO1600 for 10sec. 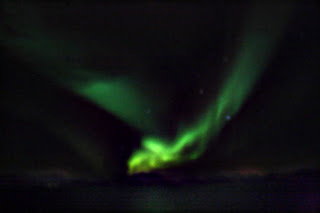 He had the camera sat on a tripod but the deck of the ship wouldn't keep still. Unfortunately, he wasn't able to do it again from a more stable position as they didn't reappear when the ship docked. He plans to go back and do it all again. 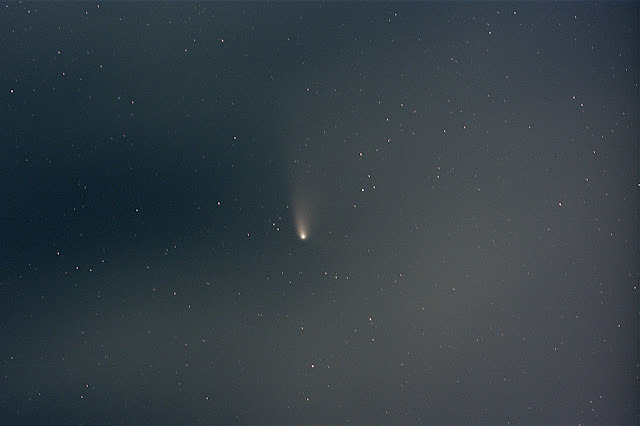 A poor night of heavy haze and thin streaky cloud, but we made the best of it. Peter was in the visual dome with the others and I was in the photographic, both working on Kemble's Cascade in Camelopardalis, and here are the results of that night. Peter used a pencil and paper, his first time, while I used the Tak106 and the M25C, unguided. 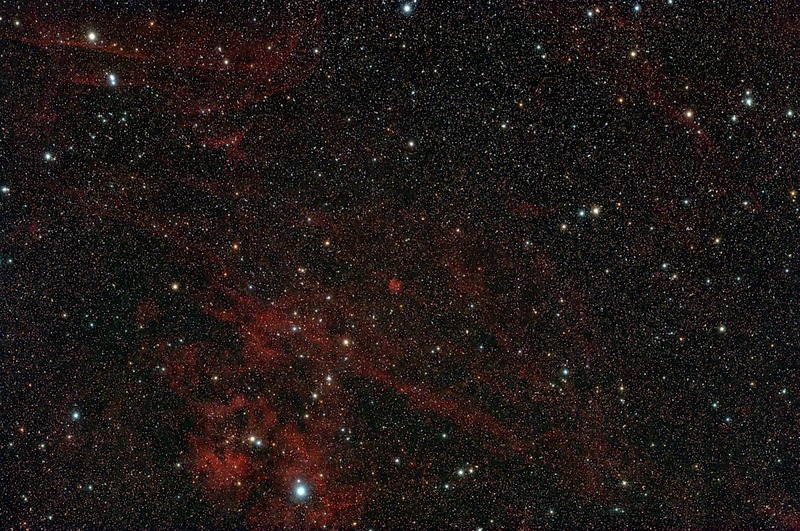 Though the line of stars is easy to pick out in the eyepiece it isn't so easy on the screen from the frames taken. Though I took some 35 frames I used only 11, making the exposure 11x30sec. Processed in Astroart and Photoshop. 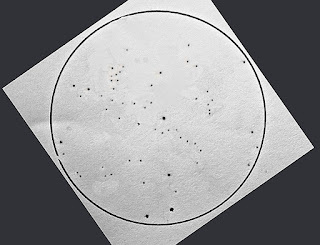 The drawing in fact does the object more justice than does the photograph, quite a pretty picture in the eyepiece, with the line of stars strewn either side of bright blue star, SAO 12969, and ending near the small Open Cluster NGC1502. There were lots of arguments that night among the other observers as to its orientation on the laptop screen, as they all moved from the big Meade in the old dome to the laptop screen in the new dome to compare, but the orientation I used gets it all onto the frame in a reasonable manner. Northwards is almost exactly from the bottom left corner to the top right. I've rotated and flipped Peter's drawing to match. At 9:04pm I saw a Fireball. It swept from Cancer through the bowl of the Plough, close to Kochab, then on to the top of Cygnus, though that was in too much haze to be sure, but certainly in that area. Could have got to Lacerta, all very low and in the murk. It was very bright, very much brighter than Venus, perhaps about mag -7 or -8. Strong green head with orange-red just behind the head. It made a steady straight line as described, then at the end, it made a slight curve downwards, as though running out of power, before it faded out quite sharply. The green head was quite steady, but the orange part behind the head threw off "sparks". 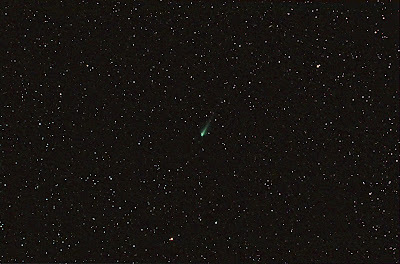 It had the overall shape of a very short tailed comet, but much more colourful of course. I heard no noise from it. Was it a fireball or some space junk burning up in the atmosphere? Certainly impressive. Taken by Broomstick Rider Number 1, while on a trip to Finland in search of a new Familiar. She found this Aurora among others. She says the little house is a sauna, but I think it's really an outside toilet.